This Pan Asian tablescape makes the perfect theme for the fall transition when hot outside air temps still feel like summer. 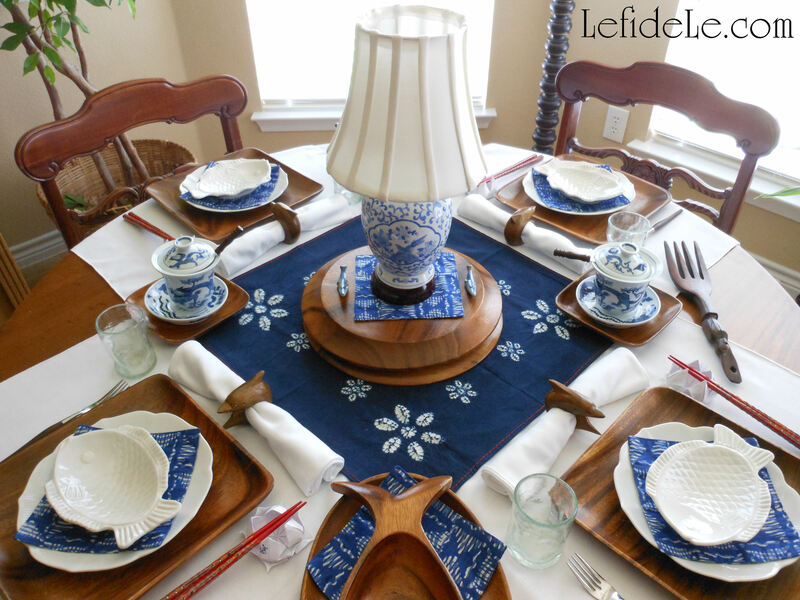 It was inspired by thoughts of wooden fishing boats sailing upon cool serene indigo waters. 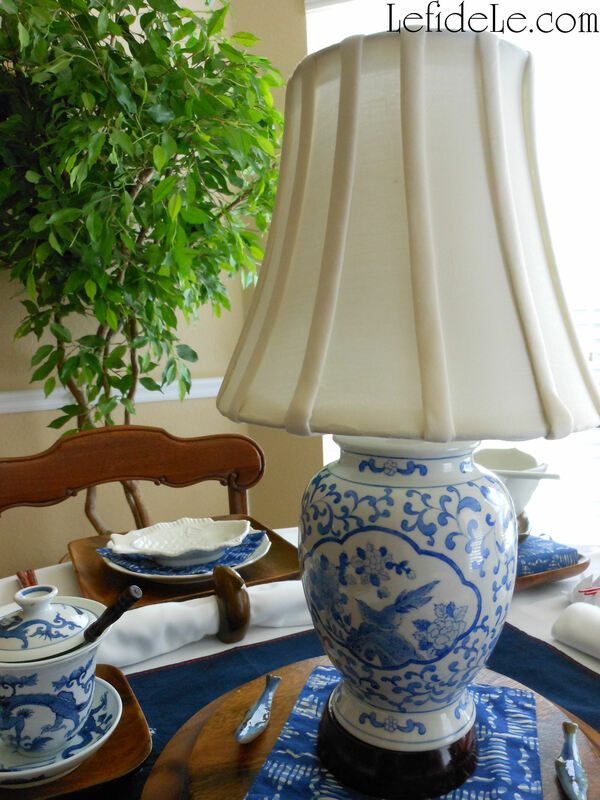 Make my Pan Asian Rice Noodle dish as a centerpiece, or just use a small lamp as ambiance for takeout. 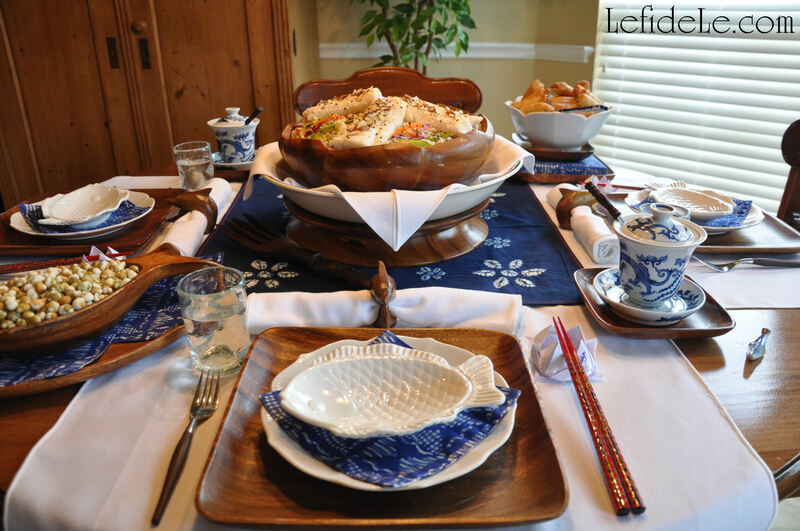 With origami waterlilies serving as décor, place-cards, and chopstick rests… it’s easy and inexpensive to put together a last minute luncheon or informal dinner. The traditional Japanese method of hand-dying cloth with indigo, known as Shibori, has produced a lovely piece to represent serene waters stacked with wooden dishware symbolizing hand hewn boats delivering the sea’s bounty. 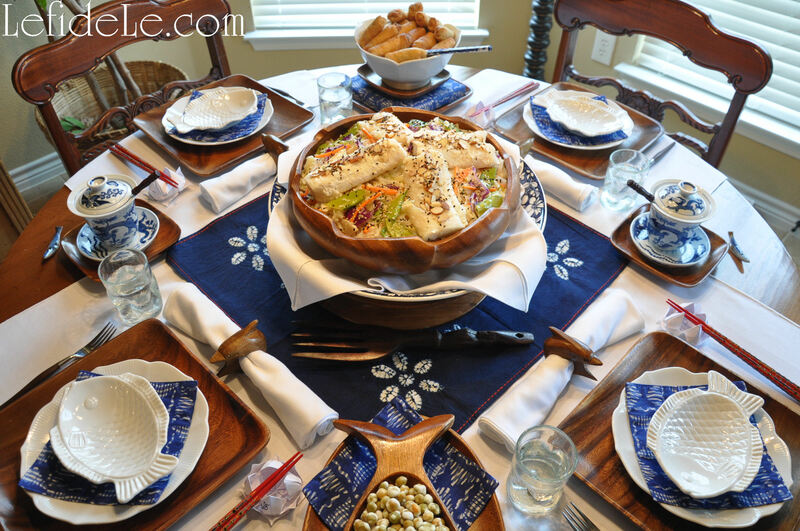 The vintage carved salad bowl was laden with Pan Asian rice noodles with veggies and creamy coconut milk sauce with cod fish (find my allergy-friendly recipe here). This was set into a blue and white ceramic bowl layered with folded white cloth placed upon an upturned wooden plate as pedestal. A large carved wooden vintage fork stood ready for serving. White cloth napkins rested out-of-place inside vintage Philippines carved wooden dolphin napkin rings. The pristine cloth squares also functioned as placemats. 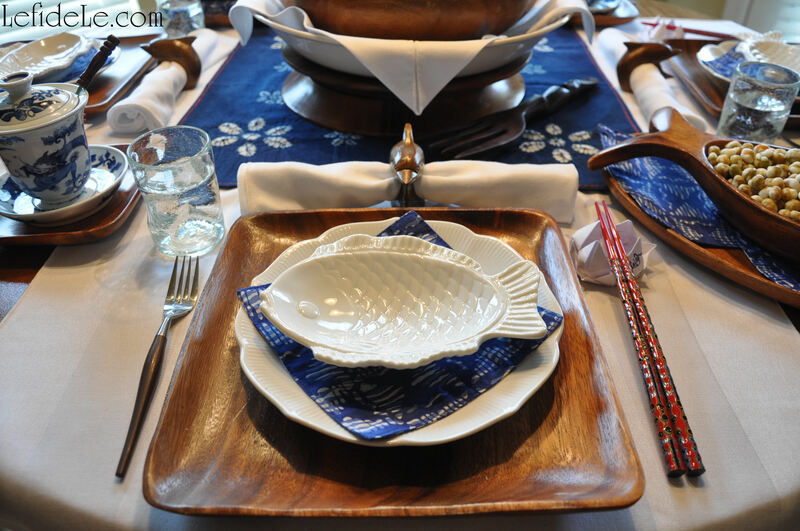 Square wooden plates from the same region held lotus blossom and fish plates softened with dyed cloth coaster napkins signifying blue waters. Small vintage crystal glasses with sides that undulated like waves crackled with patterns that emulated the splash of tides. 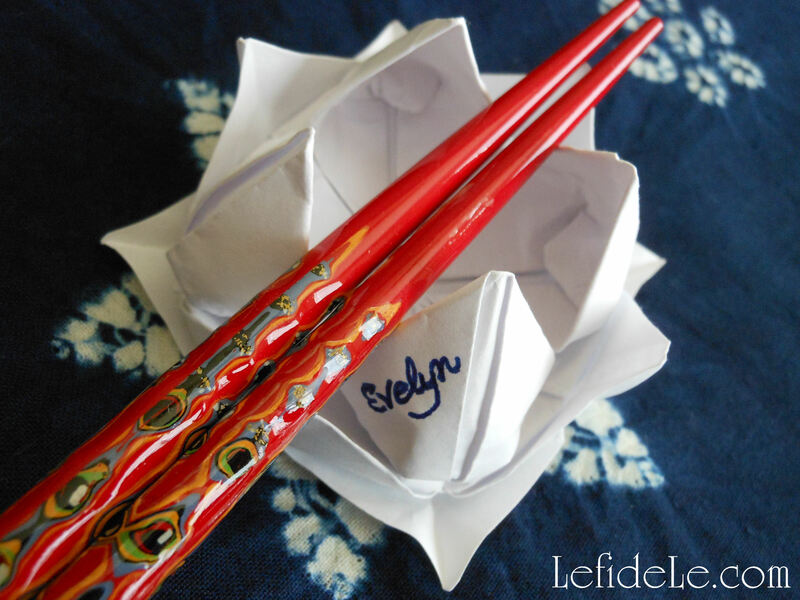 Vintage wooden handled forks were presented as an alternative to the colorfully painted chopsticks that rested upon origami lotus / waterlily blooms (see the craft tutorial here) that were marked to double as place-cards. Blue patterned and lidded tea cups were transformed into sauce containers when fitted with small wooden spoons and once infusion cups were removed. These were each placed upon small wooden plates as coasters. 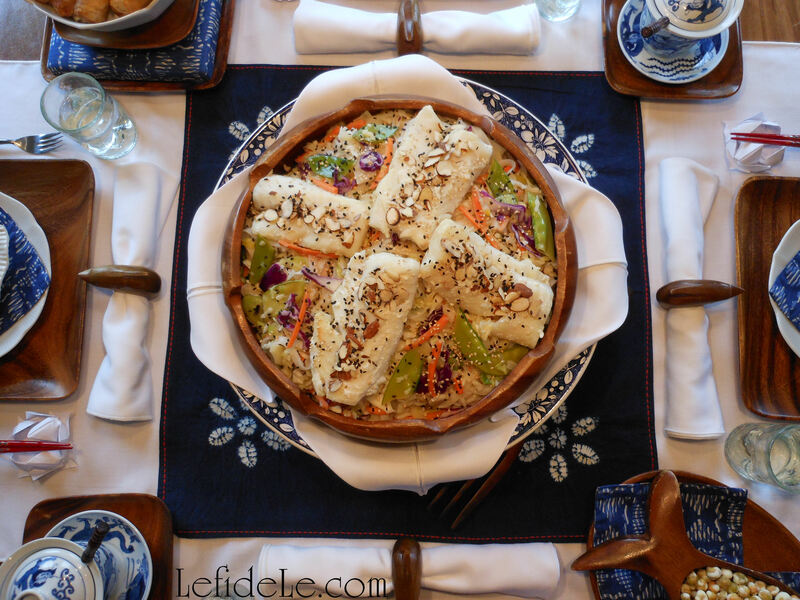 Oven-baked spring rolls were offered from a ceramic lotus bowl resting upon a batik box fit into a small wooden plate. 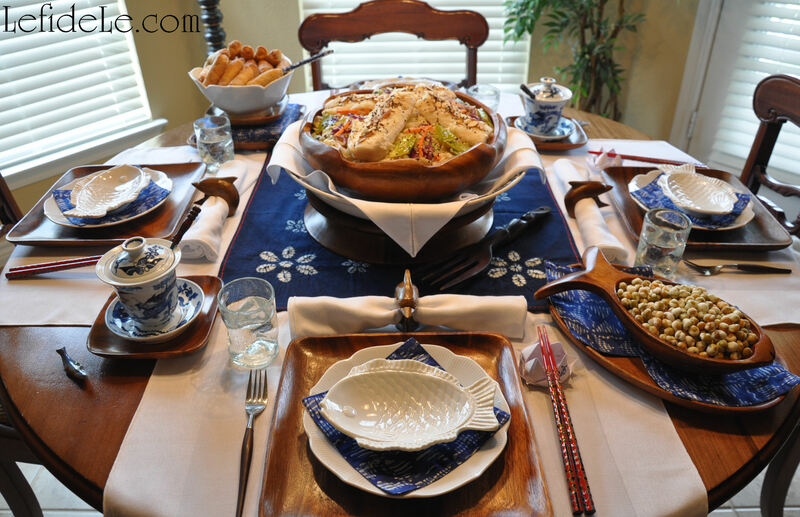 Blue patterned serving chopsticks were placed horizontally (to avoid the suggestion of funerary incense). Crunchy wasabi peas were cradled by a carved Philippine fish bowl over more cloth coaster napkins layered upon an oblong wooden plate.